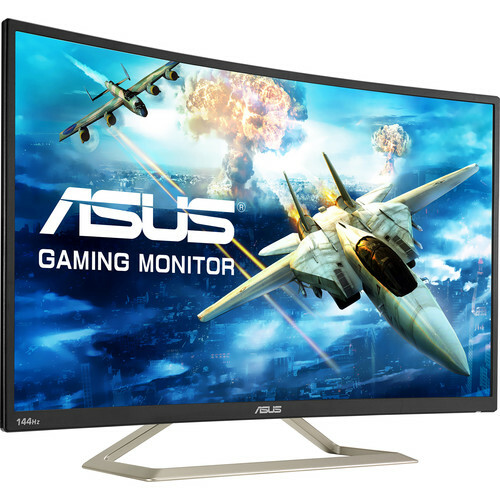 With a slim profile design and Vertical Alignment (VA) technology, the curved VA326H 31.5" 16:9 144 Hz LCD Gaming Monitor from ASUS can be viewed from nearly any angle. Regardless of how you view the VA326H, its Full HD 1920 x 1080 resolution and 3000:1 contrast ratio offer a crisp, clear picture quality. Additionally, this monitor features a 4 ms response time and 300 cd/m² brightness rating for reduced blur and a brighter overall picture. Setup and configuration of the ASUS VA326H is simple as it comes equipped with HDMI, D-Sub, and dual-link DVI-D inputs. Dual built-in 2-watt stereo speakers offer a complete multimedia experience that is great for watching movies or gaming. ASUS has even included both an Ultra-Low Blue Light Filter and Flicker-free technology within this display to reduce the strain placed on your eyes during extended viewing sessions. The 1800R panel curvature of VA326H ensures every point on the curved display is equidistant to your eyes, so you get a comfortable viewing experience even during marathon gaming sessions. Thanks to its 3000:1 high contrast ratio you can enjoy the darkest black and brightest white, and the wide viewing angles provide for minimal distortion and color shift, even when you're viewing it from extreme positions. With an astonishing 144 Hz refresh rate, fast-moving visuals pose no problem for the VA326H. The ASUS VA326H features the ASUS-exclusive GamePlus hotkey with crosshair and timer functions. Gamers can select four different crosshair types to suit the gaming environment; while the latter keeps players aware of the elapsed time in real-time strategy games. These tools allow gamers to practice and improve on their gaming skills. The VA326H features the new SplendidPlus Video Intelligence Technology that optimizes videos and images by enhancing color brightness, contrast, and sharpness. SplendidPlus features a variety of viewing modes including Reading, Darkroom, Scenery, Standard, Theater, sRGB, and Night View modes. Low-blue Light and Flicker-free technologies also reduce the strain on your eyes after long periods of use. The TÜV Rheinland-certified ASUS Blue Light Filter protects you from harmful blue light, and you can easily access its four different filter settings via a hotkey. The VA326H has undergone stringent performance tests and has been certified by TÜV Rheinland laboratories, a global provider of technical, safety, and certification services, to be flicker-free and to emit low blue light levels. The VA326H features TÜV Rheinland-certified ASUS Flicker-free technology to reduce flicker for a comfortable viewing experience. This technology helps minimize instances of eyestrain and other damaging ailments, especially when you spend long, countless hours in front of a display watching favorite videos. Box Dimensions (LxWxH) 33.0 x 23.0 x 9.0"
When is this product released? Unfortunately there is no ETA as of yet.